Kala Wewa is one of the magnificent reservoirs of the ancient world. This reservoir has a circumference of 40 miles and has a total area of seven square miles at full capacity. The ancient spill (pitawana) is measured to be 216 feet in width and 170 ft in length. For comparison, the width of the spill is more than three quarters length of a soccer field! The spill was built using hammered Granite, a solid structure one could imagine. Each block of Granite is shaped precisely to fit its neighbor. The whole structure eventually acts like one huge rock. The embankment of Kalawewa is 60 to 80 feet high with a base of more than 200 ft and a length of 3 miles. According to the tradition, a tunnel was built to carry water from Amban river to Mirisgoni river to Kalawewa. So far this tunnel has not been found. (It is not clear whether anyone seriously looked for it). Immense dam was constructed across Dambulu Oya and Mirisgoni Oyas. (Oya means river in Sinhalese). More water is obtained from Hawnell Oya and drainage coming from the Matale hills also being captured. King Dhatusena did not stop from building Kalawewa. He built a 54 mile long canal from Kalawewa to the city of Anuradhapura known as Jayaganga. It is not an exaggeration to say that very existence of the city of Anuradhapura was dependant on Kalawewa and Jayaganga. Another canal, not inferior to Jayaganga was built to connect Kalawewa with the Siyambalagamuwa reservoir and thirty other small reservoirs. According to the Sinhalese tradition, King Dhatusena appointed a man named Kadawara to maintain the magnificent Kalawewa. One day there was a breach in the bund. In order to stop the breach, Kadawara placed himself in the breach until workers repair it. During the event, Kadawara died and became a god. Today Kadawara is considered to be guarding the reservoir as a god as he did while he was alive. When George Turnour (First to translate Mahavamsa to English) visited the site, he was unable to understand why such a huge spill was built. Turnour wrote “One of the most stupendous monuments of misapplied labor in the island”. Same sentiment was expressed by Emmerson Tennent. Later it was found out that such a large spill and an embankment is necessary to withstand flood waters during the heavy monsoon season. “When we have evidence before our eyes of a bund of over 17 million cubic yards which at ordinary rates of labor in this country must have cost 1,300,000 British Pounds, a sum which would be sufficient to form an English railway of 120 miles long, and we remember that bund is one of a number of embankments that held together immense reservoirs in the country. When we have the testimony of a modern Engineering expert that as one whose duties permitted him to gain an intimate acquaintance with the ancient works he could never conceal his admiration of the Engineering knowledge of the designers of the great irrigation schemes of Ceylon and the skill with which they constructed”. Author’s Note: Above note was written in 1933, seventy years ago. Assuming an average inflation rate of 7%, the thirteen mile long bund would need 148 million British pounds (240 million US dollars) to complete it today!. As mentioned earlier, Jayaganga was built to bring water from Kalawewa to the city of Anuradhapura. 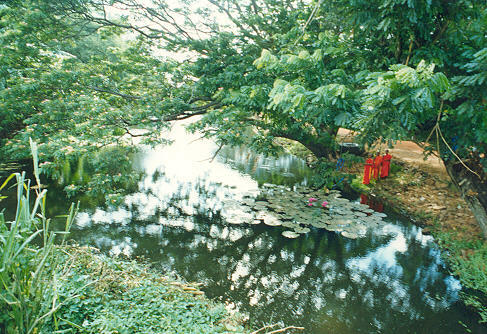 There are three major reservoirs in the city of Anuradhapura. They are Abhaya wewa, Tissa wewa and Nuwara wewa. Water from Kalawewa was used to feed these three reservoirs in the city and the Nachchaduwa reservoir just outside the city. Jayaganga is approximately 54 miles in length and 40 feet in width. Many irrigation Engineers are baffled how such a long canal with a width of 40 feet could have been planned and constructed 1,500 years ago. The gradient of Jayaganga was measured to be 6 inches per mile. (1:10,000). Maintaining such a gradient is an extremely challenging task even for the modern Engineers who have access to laser guided survey equipment. Few miles after leaving Kalawewa, the Jayaganga divides into two branches. One branch goes towards Nachchaduwa reservoir while the other goes towards the Anuradhapura city reservoirs, Tissa wewa and Abhaya wewa. King Dhatusena’s Kalawewa - Jayaganga scheme was designed to provide water to sixty village reservoirs and to the city of Anuradhapura. When Jayaganga was restored by modern Engineers, they found that ancient Engineer was waiting for them. When modern Engineers decided to locate a sluice based on modern Engineering concepts, they many times found ancient sluices buried at that same location. “Many instances might be advanced to show that in the course of restoration – both on a small and large scale – the modern Engineer frequently found himself anticipated by his ancient predecessor. In one case, a branch channel from the Jaya Ganga set out some years ago by an irrigation Engineer, was found to run along the same line as an ancient branch, later discovered, constructed to irrigate the same lands – the old and new work never being more than a few feet away from each other. (Ref: Transcriptions, Engineering Association of Ceylon, 1914). King Dhatusena’s Kalawewa - Jaya Ganga scheme was not second to Minneri/Elahara scheme of Mahasen or Parakrama Samudra of Parakramabahu. Kalawewa - Jaya Ganga irrigation scheme of King Dhatusena with a fifty four mile long canal and a reservoir of 40 mile circumference can be considered as the best engineered irrigation scheme of the ancient world. Author’s Note: Few years ago Jaya Ganga was about to be destroyed in order to mine Phosphate to produce fertilizer!. Thanks to an injunction by the supreme court, the project was abandoned.